May in the Midwest is about the most beautiful time of year. The weather finally begins to warm with some consistency, new green growth can be spotted on the trees and in the gardens. It’s one of the most popular months for weddings in Ohio, and for good reason. Ok, technically a June wedding - but with a long winter, this bouquet looks very typical of our late May designs. Photo by Henry Photography. Last year, with a late spring, our bulb flowers bloomed later, and we were able to store tulips and daffodils for all of our May weddings and Mother’s Day sales. in a typical year, the bulb flowers are sold-out mid-month. 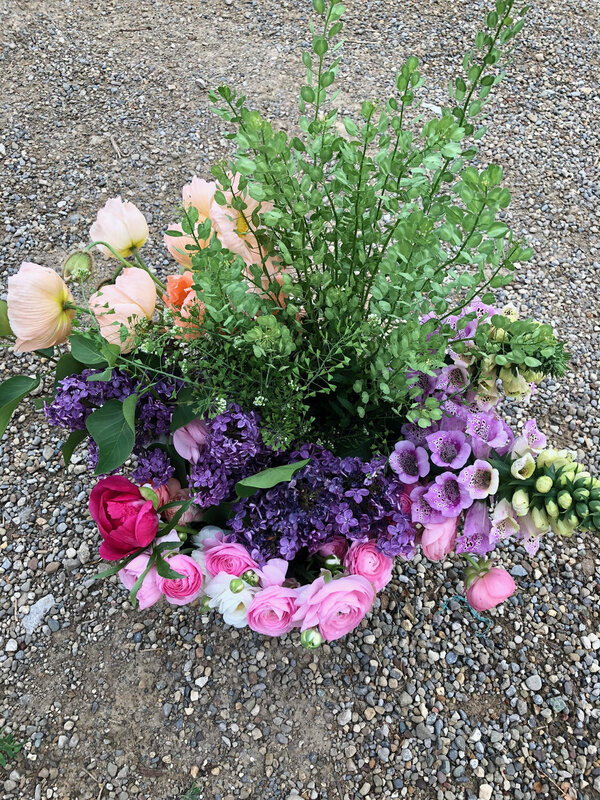 A bucket of flowers picked for a colorful, early May wedding. See the beautiful Iceland Poppies, top left? In 2017, when spring came to us early, we were able to enjoy large fistfuls of iceland poppies, the first ‘Chantilly’ snapdragons, and March sown nigella in our wedding designs. But one group of flowers that reliably shows up every year around mid-May? Perennials. Namely, PEONIES. Beautiful, creamy peonies from White Walnut Flower Farm. I loved their restrained size, but no restraint on beauty or fragrance, that is certain. While we do not grow peonies here at Old Slate Farm, mainly due to the fact that peonies have a long establishment period, and with us quickly outgrowing our current farm, a large investment like a peony field (even a small one!) wouldn’t be financially prudent (…since when did I become financially prudent?) 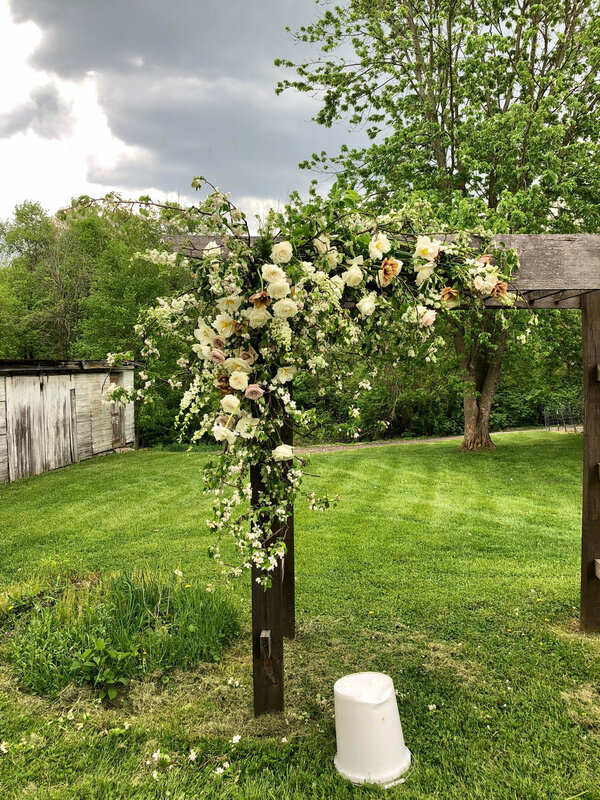 We source our peonies from other farm friends, this past year, all of our peonies for our weddings came from White Walnut Flower Farm, just 20 miles away. 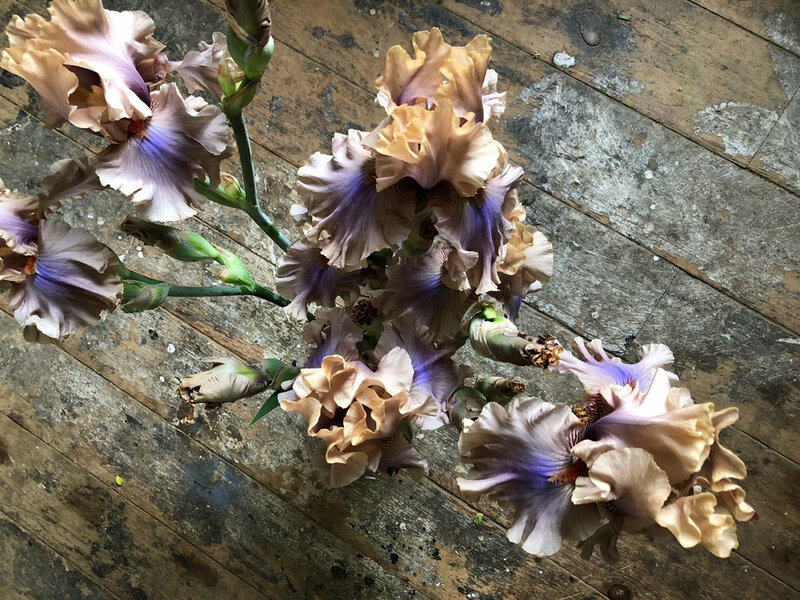 We do grow some perennials and biennials to try and bridge the gaps between the early spring bulb flowers (see last week’s post on April weddings) and the field flowers that begin to really crank out stems starting in mid-June. Included in that group around here are copious amounts of foxglove, yarrow, columbine, bearded iris, raspberry (for foliage) and clematis. Part of the perennial garden at Old Slate in May. This is ‘Apricot Beauty’ Foxglove. See the lavender blooms too? Much more growth in this part of the garden than the annual field. Annual field, circa May 17th, 218. Nothing to see here, folks. Bearded Iris. Yeah, they’re real. (Fellow farmers - I forget the variety. If anyone has to know, shoot me an email and I’ll dig around for it. Our May weddings also almost always feature gorgeous garden roses from our friends in California at Grace Rose Farm. Receiving beautiful boxes of fragrant garden roses every Thursday morning is an absolute treat, one I look forward to every week. Her roses make a spectacular accent to the fluffy peonies that we use recklessly in the month of May. May is a splendid month for an outdoor wedding, or at least a wedding adjacent to nature so you and your new spouse can sneak out into the spring air for fresh photos after your ceremony. I love how soft, romantic colors accent the warmer, life-giving weather, and many of our couples agree. White weddings, soft blushes, creams, and light blues are frequent May wedding requests. Thankfully, nature always comes through. Leave it to me to not move that bucket. Hot tip: doubles as a step stool.